This will be a summary of posts so far to bring people up to speed on the Kaizo drama. No charges have been filed by the DOJ(Department of Justice) against Kaizo or the owners of Kaizo. The DOJ and ICE(Immigration and Customs Enforcement) have been sending letters out to owners, and seizing vehicles – Guilty before proven innocent – thank you for due process. We appreciate it, big bad, Kevlar clad, gun toting agents, going after car owners with as dangerous things as a speeding ticket on their record. We appreciate the use of your budget in these times of 17% unemployment in California, and the inability of the California legislature to even keep the Department of Motor Vehicles open on Fridays. We appreciate it, thanks for running everything so well. Thanks for going after the drugs, the terrorists, and dangerous illegal aliens. These 50 or so Kaizo cars, most around the $75,000 range, are a danger to everyone everywhere. ICE agents raid Kaizos office with guns drawn and Kevlar clad agents, they seize three vehicles, leave one vehicle, and take all computers and records from Kaizo. The first three cars seized included the blue “hero” car from Fast and Furious 4. A poster from an RX-7 forum posted up some information that he later asked me to take some specific references down. I altered what I had first posted, and he took his posts down from the forum. People getting a bit too “talky”. ... ICE said that pretty much the skylines from kaizo are contra band. They are taking a snippet of the law from one part, and another snippet of law from another part. (regarding chassis and smog/manufacturer liabilities). He did say they are not far off from doing it completely legit though... He asked if i knew anyone with a kaizo car, (dont worry i didnt rat you out :] ) but he said, that as long as you get your cali-smog expempt at the begining of each year, you are fine and there is nothing they can do against you. He also said tht AZ and FL are the only states that dont give a crap about such things and thats why they are so popular to have cars registered there. The initial government investigation against Kaizo was to check out charges of smuggling and violations of the Clean Air Act. The government always goes after the Clean Air Act. Everything is still in a holding pattern until any actual charges are filed. I also found out besides the "buggy" car that was not impounded(it had a VW engine in it), the black R34 had no driveline in it. This section under "kit car policy". These regulations were written when most cars were body on frame, not “unibody” as most new cars are constructed. That is why they refer to the body, and the chassis as two separate parts. I spoke to a person today that informed me that they had a call from ICE on their vehicle. The ICE agent asked to come out and take photos of the vehicle. The person that received the call asked if the car was going to be seized, and the ICE agent said that it was not going to be seized. I advised him that he should speak to a lawyer before he allows anyone to come and investigate any of his property. What I think that ICE wants to see is the body and the engine together. They are still investigating Kaizo, and looking to see if they supplied engines and bodies together. All "public interest" legislation (and any distribution of money taken by force from some men for the unearned benefit of others) comes down ultimately to the grant of an undefined undefinable, non-objective, arbitrary power to some government officials. The worst aspect of it is not that such a power can be used dishonestly, but that it cannot be used honestly. The wisest man in the world, with the purest integrity, cannot find a criterion for the just, equitable, rational application of an unjust, inequitable, irrational principle. Some of Kaizos customers have been contacted by ICE, and agents have come out and photographed cars, and asked questions. Here is an excerpt of one of the agents visits to a Kaizo car. Then the letter states that the vehicle must be exported within 60 days of receipt of the letter. Based on the information we have, this vehicle was imported as parts, and reassembled by the owner here in the US. The US allows for vehicles to be imported into the US as parts, and there fore was not “illegally” imported as the US Department of Justice is implying. 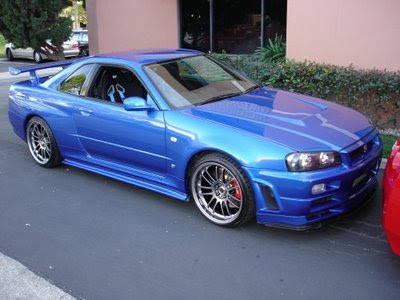 The blue R34 is the "hero" car from Fast and Furious 4, and the red car is a GTS with GTR fenders and an RB26. Its now after Labor Day, and still no charges in the Kaizo case. The government seems to be expending a lot of time and resources on these 50 or so cars and owners here in the US. I had a call recently from someone that said the FBI was also in on this investigation. They had asked some information about some transactions. So now its FBI , ICE, DOT, EPA, CARB all on the chase of about 50 cars that were sold over the last three years. In that same amount of time, about 30,000,000 cars were sold new in the US. Way to use resources to chase after the dangerous car peddlers. The same guys that pay the taxes, and registration fees on the cars they put together here in the US. Supraforums has an ongoing discussion on Kaizo here . Actually, from what they said, Kaizo was recognized in over 30 states as a manufacturer. The problem is that they never were an RI or ICI, so for them to even be bringing in these cars/parts was a bit questionable. Not even sure how Silvia's were starting to show up as well. If you are a manufacturer, then you should not be an RI or an ICI. They are different things completely. They follow different rules and regulations on importing. So if Kaizo was "recognized as a manufacturer" by a state, and states are the ones that deal with titling a car, then were they in the right ? Importing auto parts is legal. Titling cars is legal. So is this not a state issue, not a federal issue now ? Up to the individual states, like marijuana laws in California ? Although Federally its not allowed, on a state level it is allowed with certain restrictions. If Kaizo only sold rolling bodies less engine and transmission like say Rossion or Superperformance, then where are the differences ?
" How complete is a Superformance roller? Imagine a complete car – take out the engine and transmission (transaxle) and that is our replica. They are completely assembled and painted at our factory by experts that have produced over 2500 MKIII’s plus our other product lines. " "How do I register my Superformance chassis? Each state in the USA has different requirements and regulations with regards to the registration of your specially constructed vehicle. We highly recommend that you verify all requirements with your local DMV office. SEMA has posted a list of state by state registration information : visit this link. SEMA SAN." 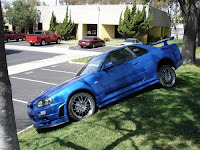 While checking out my friend Carters Jung's book - Import Tuner , in the letters section was a letter and a few pictures of the Fast and Furious Kaizo R34 on a tow truck. They mentioned that they first thought it was the “stolen” GTS from North Hollywood from a while back. This is not that stolen car. This is one of the cars that was seized at Kaizo. They mention in the article that the car was at Manheim Auto Auction in Oceanside. Since then a poster on Supraforums mentioned that they had seen the Kaizo cars being moved on a transporter. I wonder where they were being moved to ? Still no charges, or other information in the Kaizo case yet. UPDATE . Two R34's and an R32 were seized today. My information says that they are not done seizing cars. If you have a car, I would be on the look out. 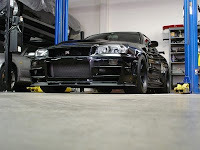 I was just informed that a Kaizo R34, an individual owners vehicle was seized this morning by ICE agents. The agents in full Kevlar served a seizure warrant to an owner in the LA area. I know the owner and the car. Again, they came to the owners residence, and seized the car from there. Details are sketchy right now, but as far as we know this is the first "owner" vehicle seized. Still no charges against Kaizo, but it seems like the government is seizing cars. The car in California was an SB100 car, so this could be one of the focuses. SB100 is a specialty constructed vehicle exemption in California. It allows for up to 500 cars per year to be registered with no smog checks if the car is accepted as a 1960 or does not resemble any other vehicle. Per California Vehicle Code §4750.1, the first 500 program applicants in each calendar year may choose whether the inspection is based on the model-year of the engine used in the vehicle or the vehicle model-year. If the engine or the vehicle does not sufficiently resemble one previously manufactured, the referee will assign 1960 as the model-year. Its a good program for specialty vehicles. Cars that are driven very little, and mostly just used to go to shows. 580. A "specially constructed vehicle" is a vehicle which is built for private use, not for resale, and is not constructed by a licensed manufacturer or remanufacturer. A specially constructed vehicle may be built from (1) a kit; (2) new or used, or a combination of new and used, parts; or (3) a vehicle reported for dismantling, as required by Section 5500 or 11520, which, when reconstructed, does not resemble the original make of the vehicle dismantled. A specially constructed vehicle is not a vehicle which has been repaired or restored to its original design by replacing parts. #3 SPCV can be a vehicle reported for dismantling that does not resemble original car. A SPCV can be any one of these three things. It does not need to meet all 3 requirements. The last line is ambiguous and open to legal interpretation. So does everyone that is reading this post feel safer now ? Do they feel better that a couple of vehicles have been taken off the road ? Are you going to help out, or stand on the sidelines and watch ? Are you going to get involved ?